Making money on YouTube requires creativity, hard work and the ability to consistently generate video content that people want to watch. In the video, below I want to share with you how to monetize your YouTube channel for beginners. Let me know in the comments below how you are currently generating revenue from your YouTube channel. Why monetize your YouTube channel? 1. Support the costs of running your channel. If you want to grow your YouTube channel, you want to constantly improve the gear that you have to create videos. It could be a new microphone, a new camera, video editing software, et cetera. Creating, optimizing, editing and promoting videos takes a lot of time. If you have a full-time job, you’ll probably do it in your spare time. In the beginning, a channel could help pay some bills but in the long-term, you can make it into a full-time income and replace the job that you currently have. Number three, freedom. I enjoy the freedom of creating and publishing videos because I can generate passive income from my YouTube channel. * YouTube gets five billion views per day. * It’s the second largest search engine on the net after Google. * Your videos can convert views into paying customers. Here are top 5 ways to monetize your YouTube channel even if you’re just starting out or you have an existing channel. These are ads that play before your video starts playing. 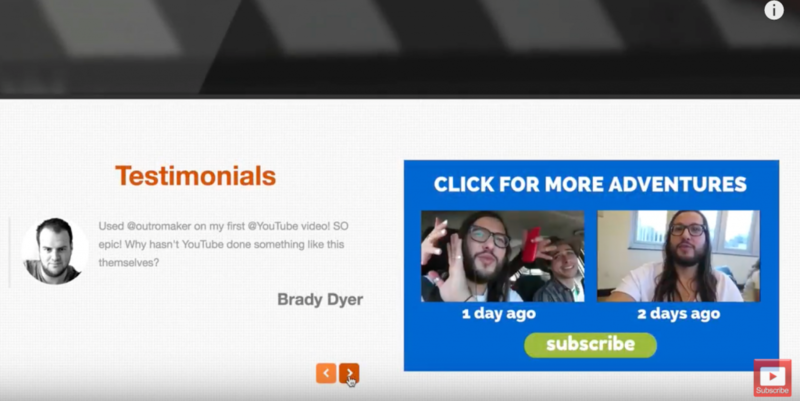 Advertisers pay to have their videos displayed on your video. The revenue that you receive by displaying the ad on your video is shared with YouTube. It’s about a 50-50 split. For example, a thousand views might earn you $1. You need to get a ton of views on your videos to generate a little bit of revenue. In order to display these AdSense ads on your videos, you need to be a member of the YouTube Partner Program. The requirements to join the YouTube Partner Program is 1,000 subscribers and 4,000 hours of watch time in the past 12 months. This is equal to 240,000 minutes in 12 months. Once you meet those requirements, your channel will be reviewed by YouTube. If you haven’t violated any of YouTube’s policies or received a strike on your channel in the last three months, there’s a great probability your channel will be accepted. Channel memberships allow viewers to subscribe to your channel for a recurring monthly fee. This is usually $4.99 per month. In return, you can give members perks like badges, emojis and other offers that they wouldn’t receive normally. If a channel has channel memberships activated, you’ll see a join icon below their video. You’ll also see the join below the channel banner. Here’s an example of what you’ll see when you click the join icon. What are the requirements to activate channel memberships? Your channel must have more than 30,000 subscribers. You must be a member of YouTube Partner Program. You must be over 18 years old. You must be located in one of these available locations. You must have zero strikes on your channel. This is where viewers can purchase chat messages during a live stream. When you purchase a Super Chat during a live stream, your message will be highlighted in the chat stream. Your message will be highlighted with different colors depending on the amount of the Super Chat. The Super Chat message will stay pinned to the top of the chat stream depending on the amount that you contributed. 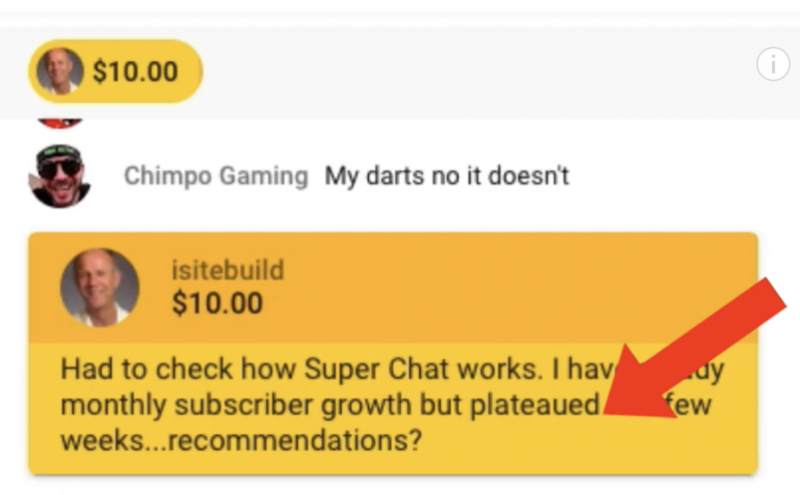 Here’s an example of a highlighted message on the chat stream from somebody that purchased a Super Chat. What are the eligibility requirements to enable Super Chat? Your channel must be monetized. That means you must be a member of the YouTube Partner Program. Your channel must have over 1,000 subscribers. You must be located on one of the available locations. You can sell branded items to your fans like T-shirts or mugs by displaying merchandise products under your videos. The websites that you use to sell your merchandise must be approved by YouTube. In order to sell merchandise from your YouTube channel, you must meet these minimum requirements. * You must be a member of the YouTube Partner Program. * You must have more than 10,000 subscribers. * You must have no community guideline strikes. Here’s an example of a channel selling T-shirts. If you don’t meet the requirements of the YouTube Partner Program, a great alternative is Patreon. Patreon allows you to have a direct relationship with your fans in exchange for recurring revenue. Here are some examples of Patreon creators. The beauty about Patreon is that you have a load of transparent fees. You keep 90% in Patreon only keeps 5% for transaction fees. * You retain full control, you own your content. * You can focus on creating while Patreon takes care of all the payments and questions. Here are some important tips to keep in mind for YouTube monetization. Build and engage audience first. Focus on increasing your views and subscribers before you think about monetizing your channel. Create great content. If you solve people’s problems in your videos and create great content that people want to watch, your channel will definitely grow. Create multiple revenue streams. Instead of focusing on one revenue stream, think about multiple revenue streams. You might get a little income from revenue stream but if you combine it with other streams, then you’ll increase your income. Determine how much money you want to make. Set a goal of how much money you want to make from your channel and how much time you want to invest. When you set a deadline for yourself, it’s easier to achieve your goal. What if you don’t meet the requirements of any of these monetization options? No worries. Just watch my next video on how to generate revenue from your channel without 4,000 hours and 1,000 subscribers. You won’t even have to join the YouTube Partner Program. Thanks for watching and I’ll see you in the next video. 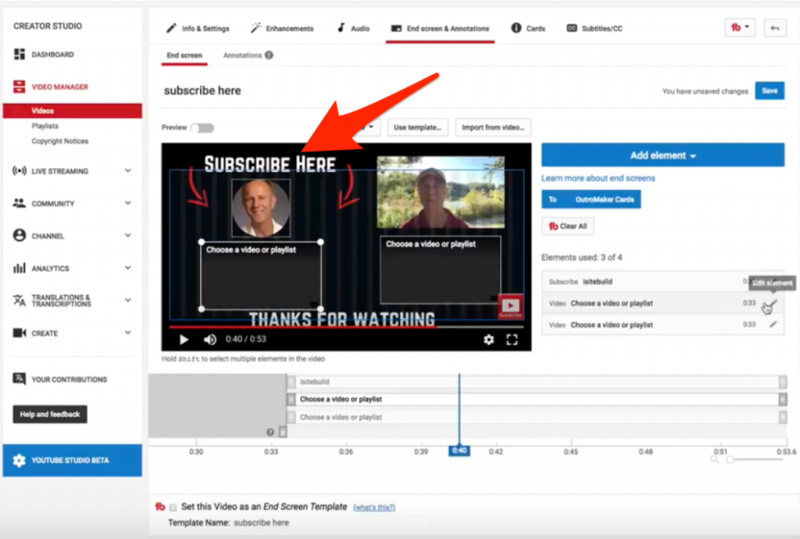 Building a successful YouTube channel is a great way to generate traffic, leads and sales on autopilot for your business or for your products. It’s not just about gaining views and subscribers. On this beautiful snowy day (watch the video above), I’m going to show you the 10 steps on how to make a successful YouTube channel for beginners. You’ll discover that YouTube is not just about gaining views and subscribers but building assets for a lifetime. Here are the 10 steps to make a successful YouTube channel. If you don’t have a clear purpose for your channel, you’re not going to be successful. Your purpose could be to make money. Your purpose could be to generate revenue so you can pay your bills. It could be to generate leads for local businesses. Perhaps you want to start a consulting business. You may want to generate leads and sales by promoting your own products and affiliate products. Maybe you want to impact people’s lives by sharing a hobby you’re passionate about. Let me know in the comments below what the purpose of your channel is. 2. Choose a niche you’re passionate about. If you don’t choose a niche that you’re passionate about, it’ll be difficult to keep going when the going gets tough. There’s going to be times for when you’re not motivated or inspired to publish a new video, but if you have a deep reason why you’re doing it, then it’ll be easier to keep going. A big question you should ask yourself is, what kind of value am I going to give to my target audience? When you clearly define your target audience and help solve their problems, people are going to watch your videos. A great way to choose a niche that you’re passionate about is just entering your main keyword in the YouTube search box. It’ll give you a bunch of suggestions of different topics. Another idea is to use the free Chrome extension, TubeBuddy. If you use the keyword explorer tool in TubeBuddy you’ll get a bunch of suggestions. You’ll also be able to see the keyword trends for a particular keyword phrase, as well as researching the competition. It’s a great time-saver for researching topics for YouTube channels. 3. Create a unique value proposition. A unique value proposition is what makes your channel stand out from others. Instead of trying to do the same thing as all your competitors are doing, try to do something different that is unique to yourself. Try to come up with one sentence that defines your channel. value proposition for your channel. 4. Design professional channel art. This also helps with channel branding. You can design a professional channel banner, a channel icon, channel trailer, video thumbnails, branded intro for your videos, perhaps a custom end screen and a website that you can associate with your channel. Ideally, your branding should be congruent so when people see your thumbnail, they immediately associate it with your channel. 5. 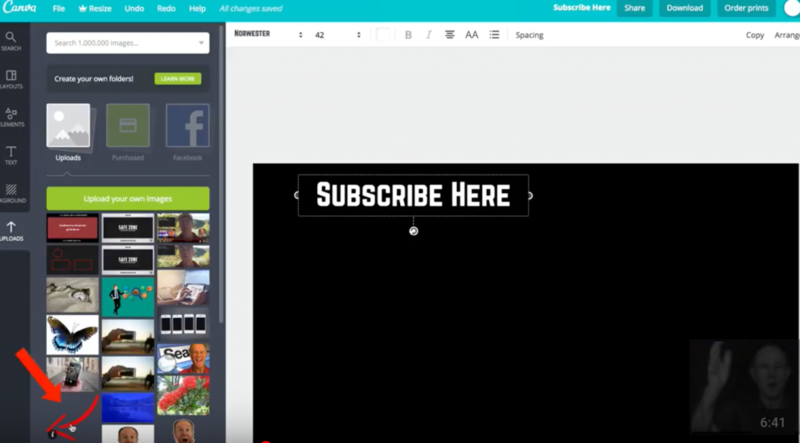 Organize your channel homepage. Your channel homepage is like the front page of a website. You only have a few seconds to make an impression upon your viewers so they’ll be motivated to subscribe to your channel. If you’re not a graphic designer, then hire somebody on Fiverr or Upwork to design your channel banner and your thumbnails. Your thumbnails are the first things people see about your video in the search engines. 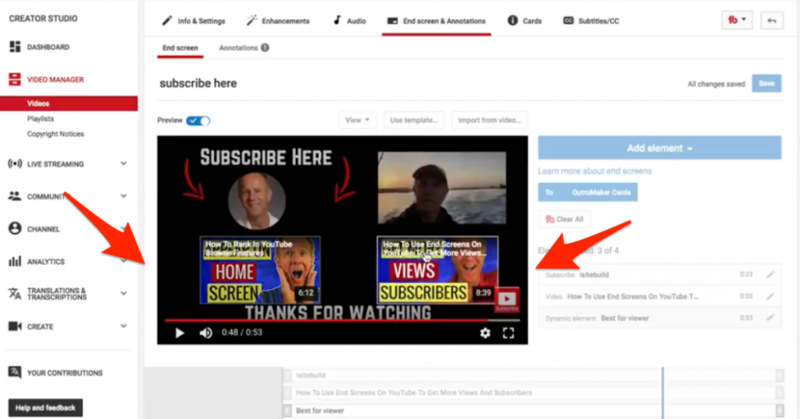 Your channel banner is the first thing people see when they land on your channel homepage. You’ve got about five seconds to make an impression. 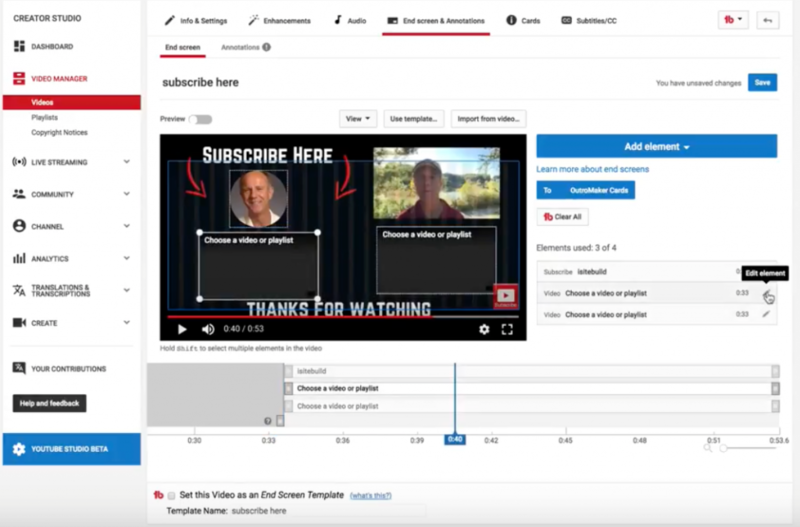 You also want to include a channel trailer of one to three minutes that summarizes the content of your channel. When people see your banner and watch channel trailer, they’ll be motivated to subscribe. For the rest of your homepage, you should create sections that contain playlists. Each section should contain a different playlist, so when someone sees your channel homepage, they can dive deeper into your content. You also want to create a good description on your about page. A lot of people will check out the about page to find out what your channel’s all about. Instead of just talking about yourself, mention the benefits to your viewers. After you’ve mentioned the benefits, then you can introduce yourself and end with a strong call-to-action, like subscribe to your channel. Another thing to do is to include your channel keywords in your description. This helps the discoverability of your channel in the search engines. Instead of thinking about one video, think about creating a series of videos that you can put in a playlist. This means that instead of somebody watching just the single video, they can watch several videos in a row. Keep in mind, one of the main ranking factors of YouTube is watch time. The longer you can keep people watching your videos, the higher the probability of your videos appearing in search and suggested videos. 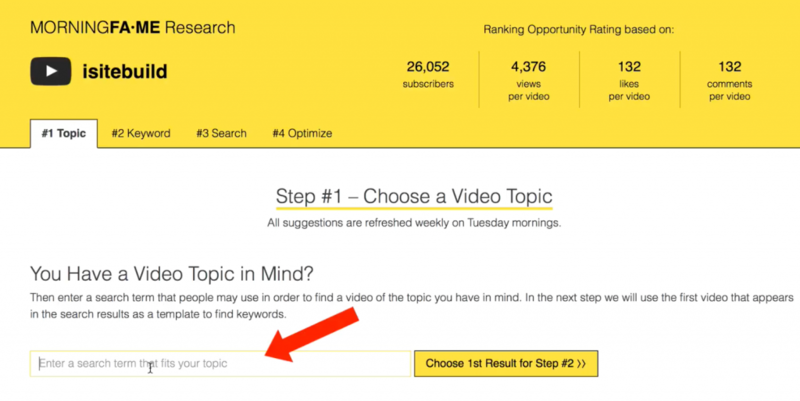 A free tool you can use for keyword research is the YouTube suggestion box. Just enter the main keyword in the YouTube search box, and you’ll get a bunch of suggestions. Make a list of all suggestions in a Google Doc so you can go back to them when you get stuck for video ideas. You can also use TubeBuddy, which I mentioned before, which is a free Chrome extension. It’ll save you a ton of time doing keyword research because it’ll give you a bunch of suggestions, it’ll show you the trends, and also show your competitors. Click here to watch my review of TubeBuddy. Another great tool is answerthepublic.com. This will show you all the questions that people are entering into Google Search about your particular niche. Instead of guessing the questions that people are asking about your niche, you’ve got a tool that shows you exactly the kind of searches that people are doing. If you install the Chrome extension keywords everywhere, it’ll also show you the search volume. Another great point about TubeBuddy is it’ll give you a keyword score so you can quickly identify if a keyword phrase is worth going after. This will save you a lot of time creating videos that never rank and how to get any views or subscribers. I highly recommend installing TubeBuddy to speed up your keyword research. My face is getting frozen. 7. Structure your videos for maximum engagement. If you’re just starting out creating videos, I highly recommend creating a script for your first video. This will help you to stay on track and stop waffling through your videos. I typically write out several scripts at once so I can batch record my videos. Instead of filming one video, I can save time by filming several videos at once. If you’re just starting out creating your channel and creating videos, you don’t need expensive gear, just start with what you got. Then when you can afford it, you can upgrade. For example, I create most of my videos for the last few years just using my iPhone. It’s only recently that I upgraded to a Canon camera. If you don’t have a phone, you can just purchase a webcam for about $50. It’s a great way to just get going. When you structure your videos, make sure you have a strong hook at the beginning, because you only got a few seconds to grab viewers attention. Expand on that hook by delivering great value throughout your video, then end with a strong call-to-action. If you follow this structure, you’ll be on your way to grow in a successful YouTube channel. When you batch record several videos in a row, you can also batch edit your videos. I typically edit my videos on time blocks so I don’t get too tired. I might spend a couple hours in the morning, one in the afternoon, and then a couple hours at night. According to YouTube, your goal should be to keep your audience retention as close to 100% as possible. This means that your viewers are watching your videos all the way through. I typically try to shoot for at least 50% audience retention rate. 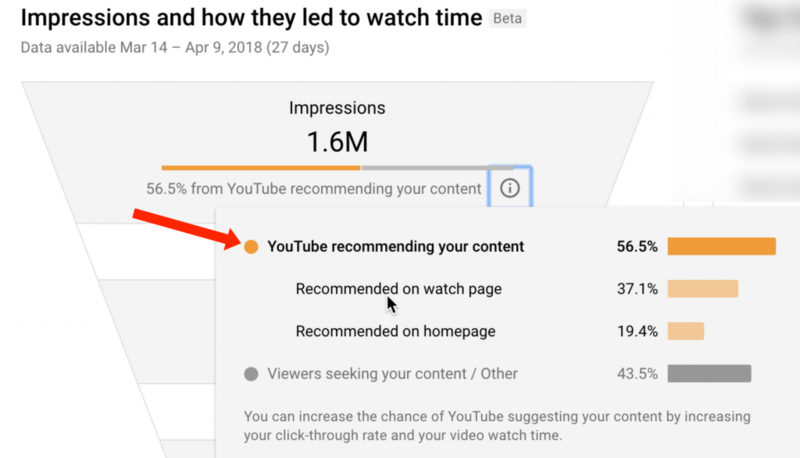 Videos that have consistent high audience retention will show up in YouTube search and YouTube suggested videos, so try to improve one thing in each video you publish. Your goal with optimization is to keep your viewer watching all the way through your videos. It starts with a great thumbnail and title. If you can get a viewer to click on your thumbnail, then they will be more inclined to watch your video. Add the keyword phrase that you research in our earlier step to the title, description, and tags of your video. Make sure you also add cards and end screens that link to a playlist so you can keep people watching more of your videos. Another great idea is to pin one of the videos that’s in your playlist to the top of your comments. When people go to comment on your video, they’ll see your pinned comment. 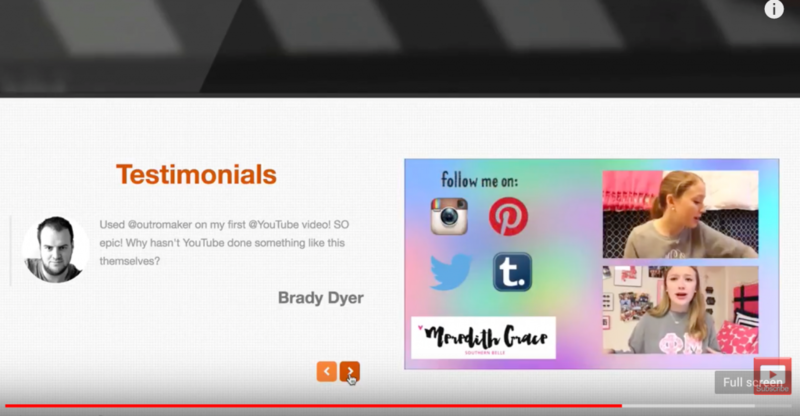 Use the share icons under your video to promote your video to social media sites. If you have an email list, promote it to your email list. If you have a website, embed it on your website. The more places you can promote your video, the more chances you have of attracting a large audience. 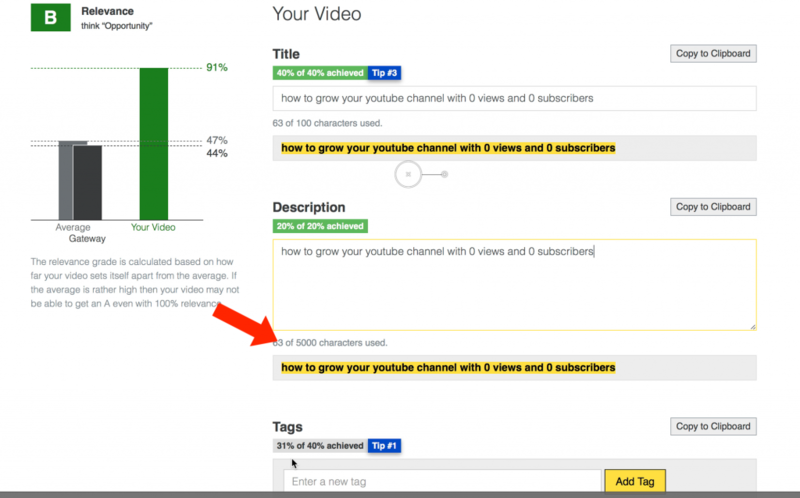 You want to keep an eye on how your videos are doing by going into YouTube analytics. If you get a high click-through rate on your thumbnails and a high watch time on your videos, your videos will do well in the search engines and you’ll get a lot of traffic. Try to work on increasing these metrics in each video you produce. Here are some important things to keep in mind. At least upload a new video every week. If you can do more than that, that’s great. 2. Reply to all comments. If people made the effort to reply to a comment, then you should reply to their comment. 3. Think of a series of videos. Instead of coming up with a script for just one video, create several scripts for several videos to save you from getting stuck with video ideas and keep you on schedule. 4. Link to a playlist instead of one video. When you link to a playlist, people will be more inclined to watch a series of videos instead of just one video. The longer somebody stays watching your video on YouTube, the more inclined your videos will rank in the search engines. 5. YouTube is a marathon not a sprint. It’s very rare that a video is going to get thousands of views right out of the gate. Therefore, be patient and keep a consistent upload schedule. If you’re not having fun creating videos like I am out in the snow here, then you’ll soon give up. Try creating different types of videos to see which one resonates with your audience. Is it possible for a small YouTube channel to rank for competitive keywords? 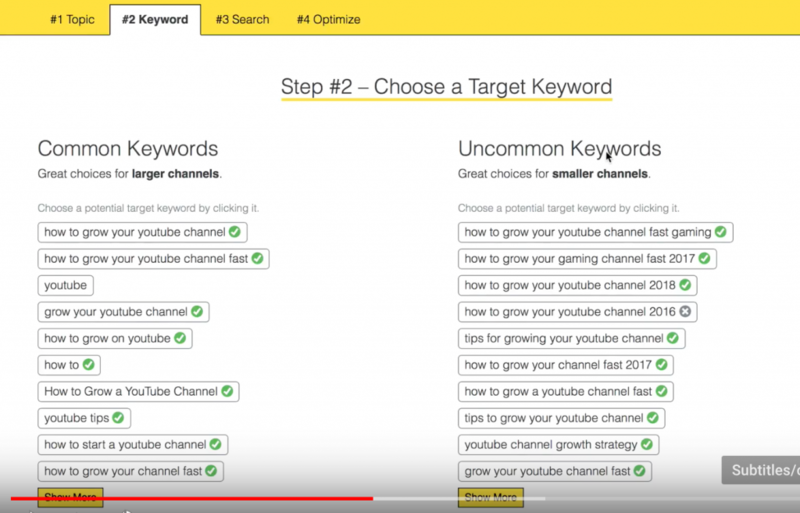 In the video below (and this article), I’m going to show you a step-by-step strategy on how to rank for competitive keywords on YouTube. 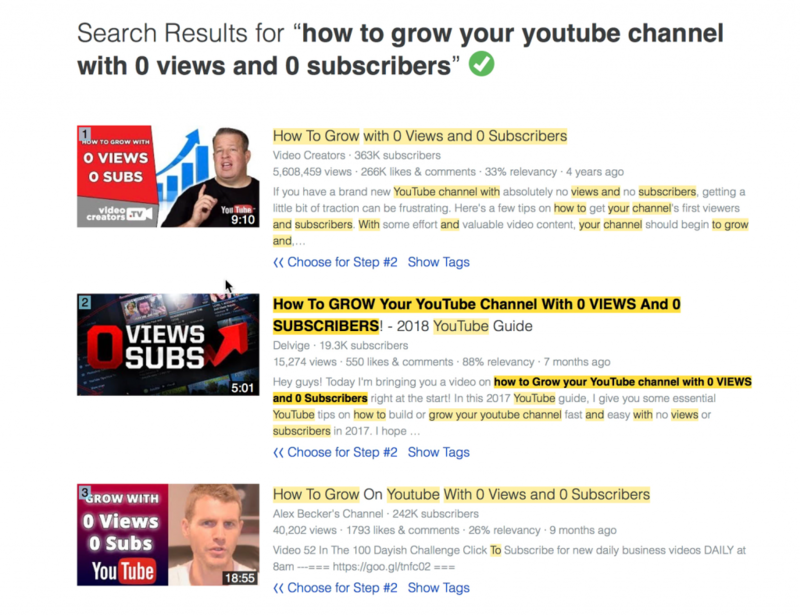 When you’re growing a small channel on YouTube, it’s hard to compete with the larger channels because have more authority, they have tons of more videos and have tons of more subscribers. How can you compete with their rankings? 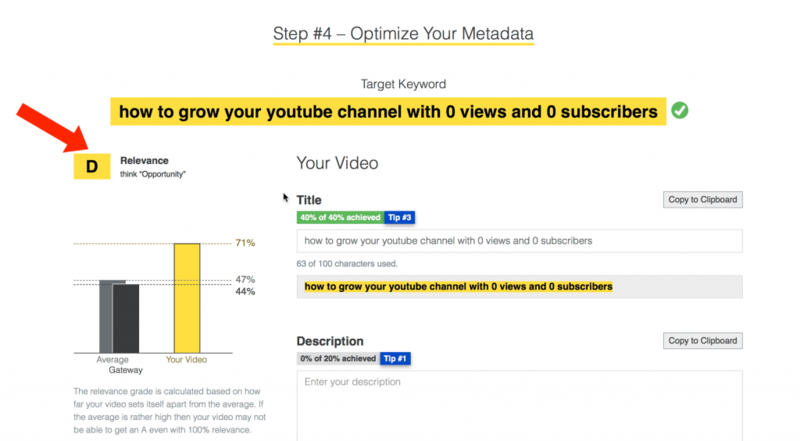 Here are the seven steps to rank for competitive keywords on YouTube. 1. Identify the competitive keyword phrase that you wish to rank for. For example, if I choose a very competitive keyword phrase like “how do YouTubers make money” and enter it into the YouTube search box. I can see there is a lot of competition. As you can see, the top YouTube channels ranking for that phrase have over 200,000 subscribers. You can see it’s a very competitive keyword phrase to rank for. 2. Identify long-tail keyword phrases. If I remove the Y from the keyword phrase, how do YouTubers make money, I get a bunch of other suggestions. For example, an alternative keyword phrase is, how do YouTubers make money without ads? This is called a long-tail keyword phrase because it consists of multiple words. I’ve also got “how do YouTubers make money from videos”, “how do YouTubers make money from YouTube Red”, et cetera. The key is to finding long-tail keyword phrases that contain your competitive keyword phrase you wish to rank for. I can also see that the search volume for “how do YouTubers make money without ads” is 70 per month. According to TubeBuddy, it has a keyword score of 72 over 100. Another way to identify alternative keyword phrases is to look at the YouTube tags of your competitors. You can easily do this when you have the TubeBuddy extension installed. For example, for this channel called Bright Side, I can easily view all the video tags it’s using, using the TubeBuddy extension. 4. Create an engaging video. The key to creating an engaging video is to solve the pain point of your viewers, in this case, I’m offering a solution to small YouTube channels on how to rank for competitive keywords. You can then outline the steps that solve the problem. The longer you keep viewers engaged on a single video or successive videos in a row, the higher probability, your video will be suggested on other people’s channels. As they’re watching the video on the channel, they’ll see the suggested videos on the right side of the watch page. These are called suggested videos or recommended videos, that may also appear on their home screen or on the subscription feed. Make sure you add the long-tail keyword phrase that you identified in your keyword research is placed in the title, description, and tags of your video. When your thumbnail, title, description, and tags, all relate to the content in your video, it makes it easier for YouTube to rank your videos. 6. Add your video to an official playlist. 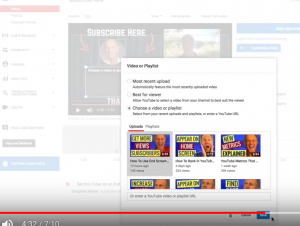 When you add a video to an official playlist rather than a regular playlist, YouTube will use the information to modify how the videos are discovered and presented. This means that YouTube will surface those videos in your playlist based upon the browsing behavior of your viewers. Keep in mind that a video can only be added to ONE official playlist (also called a series playlist). The beauty of an official playlist is that all the videos in that playlist are related to each other. When somebody watches one video, they’ll see the related videos in the playlist on the right-hand side. This will motivate them to watch another video in the series. When someone watches successive videos in a row from your playlist, YouTube will surface more of your videos to the viewers. This will result in more rankings to your videos and more traffic. 7. Repeat steps one to six for related keyword phrases. Repeat the steps that I outlined above (or in the video) for alternative long-tail keyword phrases. What kind of results can you expect by following these 7 steps? You’ll begin ranking for less competitive keyword phrases. YouTube may modify how your videos are presented or discovered based upon your viewers browsing behavior. Your videos will begin ranking on YouTube amongst the competitive keyword phrases of larger channels. Your playlists can also rank on YouTube because it has a different URL than a regular video. If there’s a topic you wish to rank for that has a ton of competition, create a series of videos tagging long-tail keyword phrases for your titles, then add them to an official playlist so YouTube will modify the way that your videos are presented based upon a viewer’s behavior. Do you want a grow your YouTube Channel this year so you can attract more views and subscribers? Let me ask you a question, do you want to get a trickle of traffic or a waterfall? Imagine getting views and subscribers on autopilot, even while you’re sleeping or on vacation because your video ranks on the first page of YouTube. In the video below, you’ll discover how to write YouTube videos fast in 2019-2020 and beyond, whether you have a small channel or a big channel. at TubeBootCamp.com It’s a 100+ page ebook containing screenshots and a table of contents so you can quickly navigate to any section. If you have multiple videos that get high rankings on the search engines your channel will grow fast. Some of the top ranking factors for YouTube videos include watch time, audience retention, viewer velocity, thumbnail click-through rate, engagement. I’ll explain these more deeply later in this article. Let me show you the steps to write YouTube videos fast. If you get the step wrong then your time will be wasted, you want to select the correct keywords to place in your title, description, and tags, the key to finding keywords that you can rank for is to find less competitive keywords, instead of focusing on one word, think of three or four words. For example, if I enter a keyword phrase, how to train a puppy in the YouTube search box, I get a bunch of different suggestions. These are all keyword phrases that people are typing into the YouTube search box to find out information about them. What you want to do is find a keyword phrase that is less competitive so it’ll be easier to rank for. This keyword phrase should not have too many videos ranked on the first page of YouTube. If your video is the only one rank for that phrase there’s a high probability it’ll appear at the top of the first page. My recommendation is to create a list of 10 or 20 keyword phrases that you’ve researched and use them as topics for your videos, Instead of creating one video or one topic, you have a series of videos around the similar topic, you can then put them in a playlist and also rank for that playlist. 2. Create an engaging video. Now that you finished the keyword research for future topics for your videos it’s time to create your first video. As I mentioned before the top ranking factors for YouTube search is audience retention and watch time. The longer someone stays watching your video, the higher probability your video will appear in YouTube search and YouTube suggested videos. Keep in mind that YouTube’s algorithm follows the audience, so you need to create content that the audience wants to watch. Ask yourself, what kind of content does your audience enjoy? If you create videos that offer solutions to peoples’ problems they’ll remain engaged with your video. How do you create an engaging video? 1. Create content that your audience wants to watch. The content of your video should expand upon what you promised in the title of your video. The first 5 to 10 seconds of your video is crucial for people to continue watching your video. Use a hook like a question or tell people what’s coming up in the video. This could be a motion graphic of your logo where you just introduce yourself. The main thing is to keep it very short because you want to be there for your audience. The meet is the main content that you’re providing to your audience, this could be a series of bullet points that explain more deeply what you conveyed in your title. End your video with a strong call to action. One of the best ways to do this is to point people to another video that’s related to the video that they’ve just watched. Alternatively, if you’re trying to collect leads, you can point them to a cheat sheet or a free e-book that they can download. Just keep in mind that when you do this you take them off YouTube. Don’t do this in every video, YouTube wants to keep people on their platform as long as possible. A couple of important things to keep in mind is to actually say the title in your video, this helps Google to recognize the topic of your video, also when you transcribe the content of your video these keywords will be in the transcript. The most important factors when it comes to optimizing your video are the thumbnails, the title, description, and tags. Think about the path of the viewer. A thumbnail is the first thing they see in the search engine. According to YouTube if you have a high click-through rate on your thumbnail then YouTube will surface more of your videos. When you create a thumbnail make sure you use contrasting colors, bold text, use few words and include your face if possible. It’s a good idea to create several different thumbnails even before you shoot your video so you have different options to choose from. Use exact keyword phrase that you came up with in your keyword research. 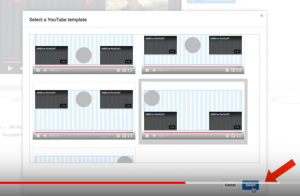 Your titles and your thumbnails should work together to preview the content of your video. You might also want to make the title more catchy by adding an emotional trigger to the title. Instead of just satisfying the search engines you also satisfy your viewers. Descriptions help viewers find your videos in the search engines. I often read the first three lines of description while I’m watching the video because the first three lines appear under the video. It should be a summary of the content of your video. Place your most important keywords at the beginning of your description. Use the rest of the text in the description to provide extra information. This could be linked to a playlist or related videos plus your social media channels. You also have the option of including hashtags in the description. These appear as clickable links under the video. Click here to watch my video on how to add hashtags to your videos. The purpose of your tags is to make it easier for YouTube to find your video. Make sure you include keyword phrases that relate to the content of the video. I usually have the title of my video in the first tag. I then add related keyword phrases for the other tags. One of the best tools for doing keyword research and finding the correct tags is TubeBuddy. Click here to watch my video on how to find the best tags using TubeBuddy. The main purpose of Cards and End Screens is to redirect viewers to a related video from the video that they’ve just watched. Instead of linking to a solo video, link to a playlist so they binge watch your videos. As I mentioned before, the longer they keep watching one video or successive videos in a row, the higher probability your videos will appear in youtube search and youtube suggested videos. Now that you’ve optimized and published your video, your work has just begun. The first 24 to 48 hours of your video going live on YouTube it’s crucial for ranking success. This is called view velocity which you’re going to find in YouTube analytics. If you can drive a lot of views in that period of time your video has a high chance of ranking well on the search engines. * I also recommend transcribing your video because Google picks up keywords that are mentioned in your transcript. You can then repurposes that transcript by converting it into a PDF file and uploading it to documents sharing sites. This will help to drive traffic to your video. 5. Track the performance of your videos. If you go to your Traffic sources report, you’ll be able to see where most of your traffic is coming from. Most traffic will come from YouTube search and suggested videos. If you click on those links you’ll be able to identify the videos that brought that traffic. My recommendation is to keep doing more of what works. If you find a video that ranks really well and gets a lot of traffic, create more of the same types of videos. According to YouTube, when you create something that’s working for your audience, create more of it. You’ll deliver more of what your viewers like. 1. YouTube follows your audience. Make sure you always create content that your audience wants to watch and your videos will do well. Your audience will decide if your video will get high rankings or not. It’s not up to the YouTube algorithm. 2. Make small tweaks to every video. Try to improve every video that you publish. For example, you could improve the thumbnail, your audience retention or the way that you deliver the content. 3. Not every video will rank well. Every video that you create no matter how long you spend on it will not rank on the first page on the search engines. Keep in mind that sometimes a video will rank after a few months or even after a few years, so patience is the key. Of course, sometimes a video will do really well if you follow a trend. Click here to watch my video on how to capitalize on trending topics so you get views and subscribers really fast. 4. Multiple ranking videos will generate a river of traffic. The more frequently you upload engaging videos, the faster your channel will grow. Have you noticed some new hashtags appearing on YouTube above the videos title? videos more discoverable and how do you add them to your videos? So what is a YouTube hashtag is used for? When you add them to YouTube videos it’s an easy way to find videos on related topics. For example if somebody clicks a hashtag that I used for my channel it will show the related videos for my channel. This will result in longer watch time because people are staying longer on YouTube. If they stay longer on YouTube watching more of my videos then more of my videos will appear in search and suggested videos. 1. You can enter the hashtag and the YouTube search box and related videos will pop up. 2. Click the hashtag in the video title above the video title or in the description. This will also give you a page of related results with the hashtag. How do you add hashtags to your videos? If you want to add hashtags to a single video go to your video manager select the video that you wish to add hashtags to click Edit. Add the hashtags to the bottom of your video description or you can also add them to your video title but for right now I’d recommend just adding them to the video description. Make sure you include a hashtag at the beginning of word and don’t include any spaces if you’re joining two words together. According to YouTube the more tags you add to a video the less relevant they become for users who are searching so if the video has more than 15 hashtags YouTube will ignore all the hashtags on that video. If you over tagged a video YouTube will remove that video from your uploads or from search. Also make sure you don’t add hashtags that are not directly related to the video that you’ve uploaded. If you add misleading or unrelated hashtags this will also result in the removal of your video. Click here to read the YouTube’s misleading metadata policies. If you want to add hashtags to the description of multiple YouTube videos go to your video manager. You can check the box next to actions to add hashtags to all 29 videos on the page or you can select all your videos then just click the actions box – click description – add your hashtags in the box – append to end. You also have the option to append to start, set to or remove. If you want to add hashtags to select videos then just check the boxes of all the videos that you wish to select. Click the actions box, select description and put the hashtags in the box then select “append to end.” If you want to put it to the end of the description. After you’ve done that just click “Submit” to add them to the description. hat if you want to add hashtags to all future videos that you publish? Just click on channel – click upload defaults, then you just add them in a title or in the description at the bottom. After you’ve done that just click Save and your hashtags will show up on all future videos that you publish. So how do you find relevant hashtags to use on your videos? My recommendation is to use your channel name in one of the hashtags. If someone clicks on the hashtag all the related videos of your channel will show up on the page. Experiment with popular hashtags that occur on Instagram and Twitter to see if they work on YouTube. Another idea is to use a specific hashtag that’s just related to your own channel. When someone clicks on that hashtag they’ll discover the videos that are related to the video they’ve just watched. This will result in more watch time for your YouTube videos, higher rankings and more traffic. 1. Currently hashtags can only be viewed via a web browser on your computer or through the Android app. Hashtags don’t appear on the iOS app. This means you won’t currently see them on your iPad or iPhone. 2. 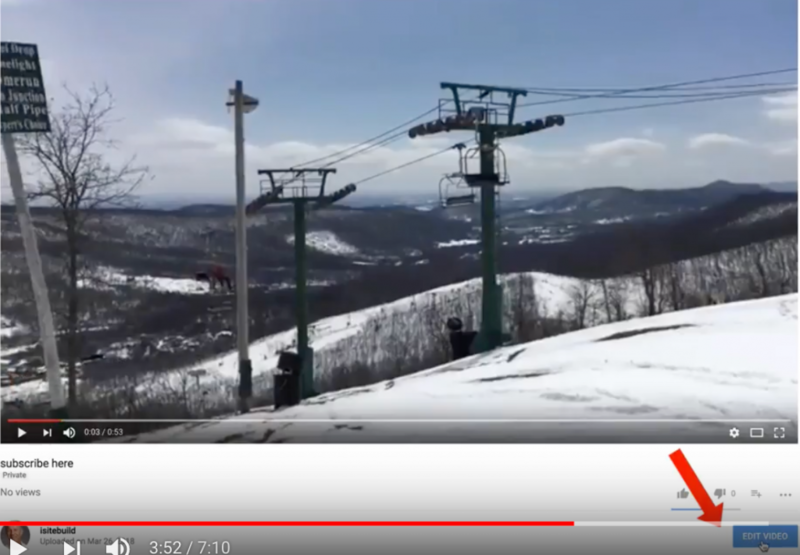 Only the first three hashtags in a video description will appear above your video title. 3. You can add hashtags in the description of previously uploaded videos. The hashtag will appear above the video titles for those videos. Now you know how to get more views to your YouTube videos using hashtags. Thank you for helping me to get to 30,000 subscribers. Without you all subscribing to my channel, I wouldn’t have achieved this goal. 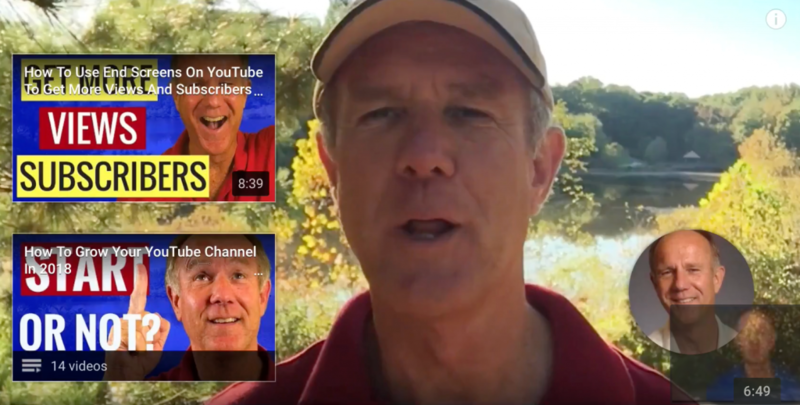 I’d like to share with you my top 10 tips on how to get 30,000 subscribers on YouTube. If I can do it, you can do it too. 1. Choose a niche you’re passionate about. If you’re not interested or love the niche that you’ve chosen, you’ll soon lose interest when the going gets tough. Especially when you start a new channel, you’ll only get a few views and subscribers per video. This can be very discouraging and you may have an inclination to give up. If the goal of your channel is just to share information and not make money, you’ll have an easier time with your channel. I started my channel in 2006, but I only really focused on YouTube in the last few years. 2. Find low competition keywords. If you target very competitive keyword phrases, it’ll be very difficult to rank for them and so you’ll be just wasting your time. Instead, target keyword phrases that are less competitive, so it’d be easier to rank for them. As your channel grows and builds more authority, it’ll be easier to rank for more competitive keywords. 3. Plan out your content ahead of time. If you plan out your content one or two weeks in advance, you’ll be less stressed to produce videos on a regular basis. One of the best habits I’ve got into is to just jot down ideas as they come into mind. You can do this with Google Docs or just use the Notes app on your phone. This will prevent you from running out of ideas. Make sure you also produce content that your audience loves. Visit groups, forums, and live streams where your target audience hangs out, so you can find out the kind of questions that they’re asking. I discovered that if I plan out a series of videos on the same topic, then it’s easier to come up with new content. This also helps viewers to binge-watch your content, so you get more watch time which Google loves. 4. Make your videos engaging. YouTube rewards videos by promoting them on YouTube search and YouTube suggested videos. If 50% of your viewers watch your video all the way through to the end, then YouTube will promote your video on other people’s channels. Make sure you always grab your viewers’ attention within the first five or 10 seconds of your video. You can do this by asking a question or stating up front what the video content is about. Also try to change the scenery of your videos every 10 to 20 seconds. You can do this by adding graphics, transitions, B-roll, linking the cards and even asking a question. YouTube rewards channels that keeps people watching successive videos in a row. Therefore, as I mentioned earlier, think about creating a series of videos on a similar topics, so you can add those videos to a playlist. Instead of linking to a single video, link to a playlist, so people will binge-watch your videos. This will help increase the accumulated watch time on your channel which will result in more channel authority. When you have more channel authority, it’ll be easier to rank your videos. One of the videos on my channel that got a lot of traffic in a short amount of time was a video that rode a trend. When YouTube came out with the new requirements for the YouTube Partner Program and to enable monetization on your YouTube channel, I quickly created a video that talked about the alternative ways to monetize your content. This video did very well because I capitalized on a hot trend. 7. Avoid comparing yourself with others. When you compare your channel’s growth to the growth of your competitors’ channel which may be much faster, it’s easy to get discouraged and lose confidence. Instead, focus on improving your own videos and your own channel. There are many unseen factors which may contribute to the faster growth of your competitors’ channel. For example, they may have a huge social media following. They may be more passionate, charismatic, and have better presentation skills. Just keep in mind, there’s only one of you in the whole world and people are attracted to your unique style, presentation, and personality. Nobody can copy you exactly, so instead of comparing yourself with others, try to improve your own videos and your own channel. For example, you can improve your thumbnails. You can upgrade your video background. You can improve your audio. You can improve your presentation skills. YouTube is a social community, so people expect to interact with you. Make sure you interact with your viewers and subscribers by replying to their comments. If they get to know, like, and trust you, they’ll be inclined to watch more of your content whenever you publish a new video. Also invite them to connect with you on other social media platforms. If you don’t upload videos on a regular basis, your audience won’t know when to expect new content. When I first began my channel, I didn’t publish new videos on a regular schedule. As a result, my channel growth suffered. Over the last few years, I’ve been publishing new videos every Monday, Thursday and now, I do live streams every Friday. 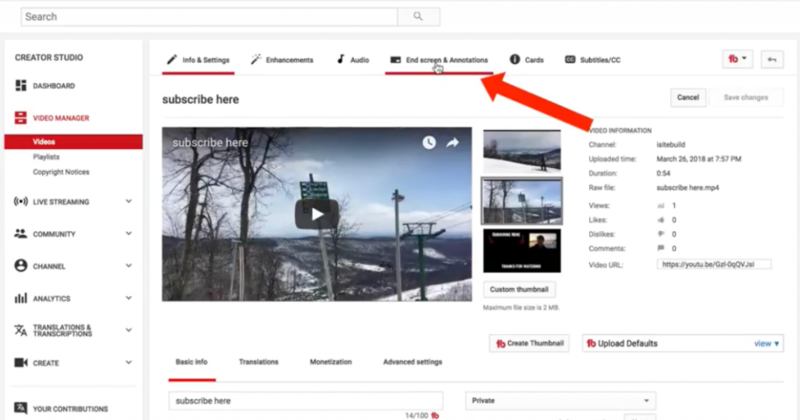 If you increase the upload frequency of videos to your channel, it will trigger the YouTube algorithm and YouTube will promote your videos on YouTube search and YouTube suggested videos. One of the best ways to constantly improve your videos and grow your channel is to study your YouTube analytics. Study your click-through rate to see what percentage of people are clicking on your thumbnails to watch your video. Study your average view duration, watch time, and the audience retention to see how long people are watching your videos. If people are dropping off at the beginning, change your introduction. If people are leaving at the beginning or halfway through your video, then link to a related video in the card. Keep an eye on your traffic sources, so you know exactly which videos are getting the most traffic. When you know which videos get the most traffic, you can just create more of the same videos to capitalize on that traffic. Now you know 10 ways to get 30,000 subscribers on YouTube. Keep in mind that YouTube channel growth is a marathon, not a sprint because most channels grow steadily over time. Do you want to increase the watch time for the videos you’re publishing on YouTube? 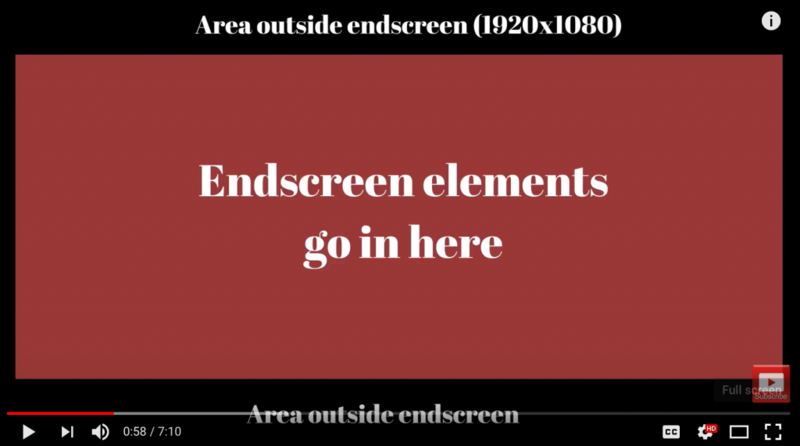 End screens encourage viewers to take action and extends the watch time on your YouTube videos. 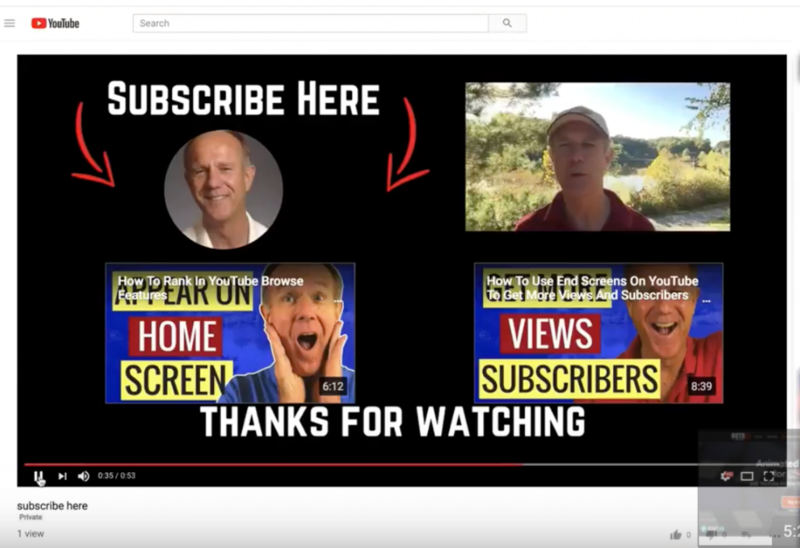 The problem with the end screen templates that YouTube provides is that they don’t include calls to action on the template, so it’s not obvious to viewers what action to take. using Canva that includes several calls to action. Here’s an example of a video displaying one of the generic end screens that YouTube provides. Here’s an example of a custom end screen template I created that includes several calls to action. 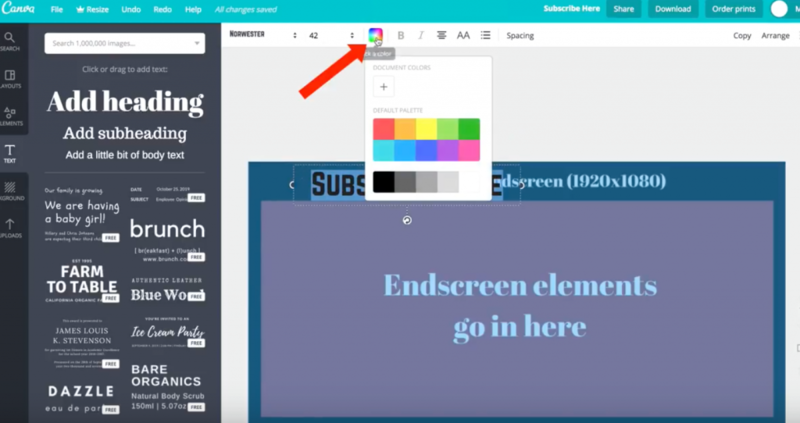 Here’s how to create a customized end screen template using Canva. 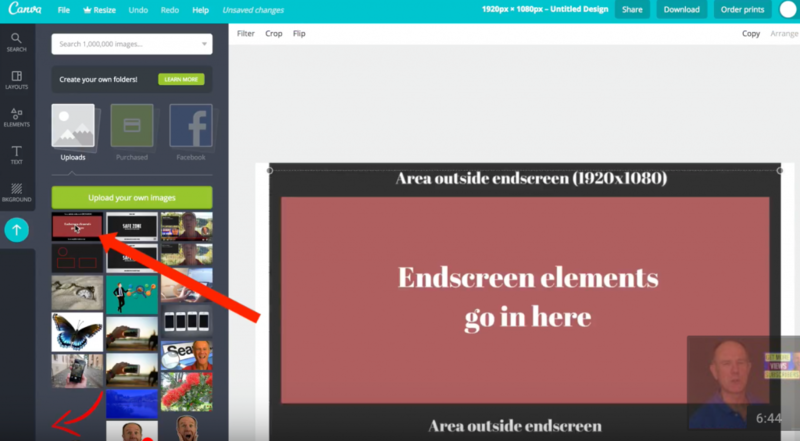 Go to canva.com, click Use Custom Dimensions. Okay, it’s uploaded here, so I’m going to bring it in. The whole area is 1920 by 1080 pixels. 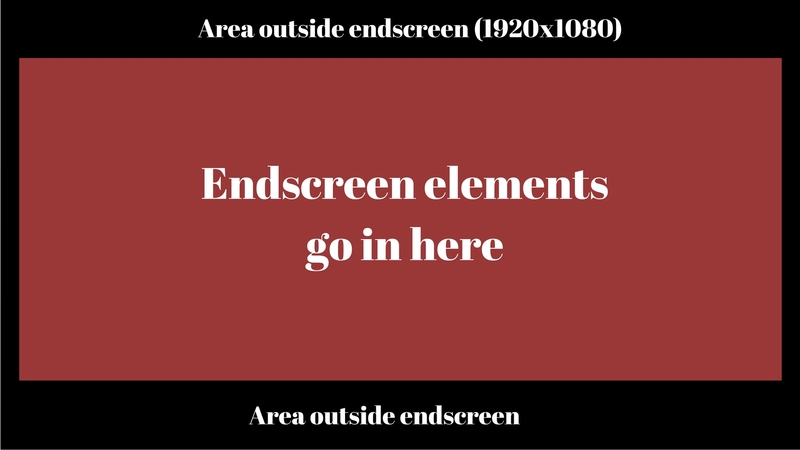 The area for the end screen elements go in the middle. This is the area YouTube provides. blue background on there, then I can add some elements. Add the subscribe text. We’re going to change the font to Norwester for this one. I’ll move the word SUBSCRIBE just outside the elements and then change the color. Click on the color at the top here, change it to white. Check how it looks. I decided to change the color of my template to black. I’ve got Subscribe Here, then maybe we’ll add a couple of arrows. I’ll just bring this arrow in here and move it around a little bit, shrink it a bit. It’s not going to be perfect for this demonstration, but you get the idea. Save the template as a JPEG and download it to your desktop. I then bring the template into the timeline in my video editing software (Screenflow) to add the video that will be displayed in the last 20 seconds of the uploaded video. I’ll shrink the video so it can be positioned top right of my template. I then process the video and upload it to YouTube to see how it looks. 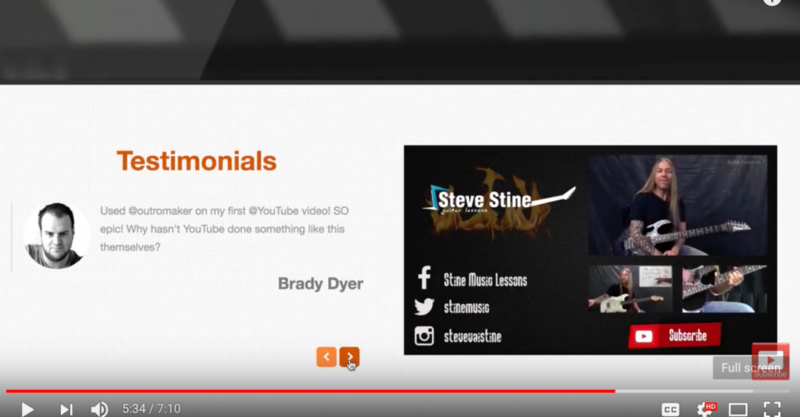 I want to use the end screen template that has one subscribe and two videos or two playlists. “Thanks for watching,” I can move it a little bit higher and align it a little bit better. We got our subscribe element here. Then we’ve got the Choose Video Playlist. Let’s select this one for now, then we’ll select Best for Viewer, click Save. It says, “Please add space between the elements,” so I got to move “best for viewer” down a little bit. they’ll see the big red subscribe button to click on. If they hover over these or click on any of these elements, then they’ll go to that particular video or playlist. 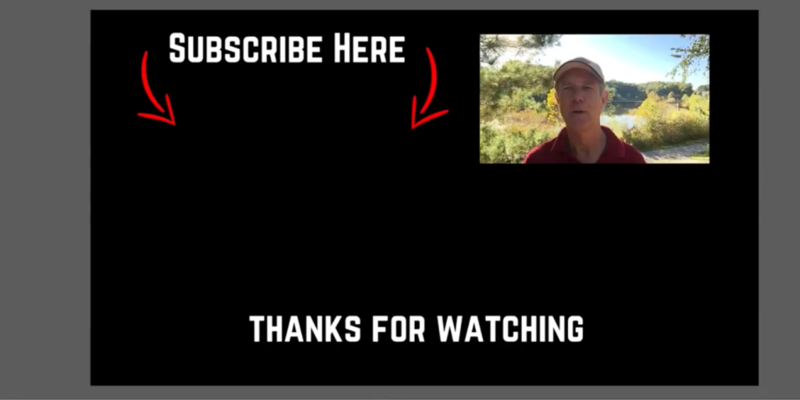 Here’s the completed end screen when viewed on YouTube. As you can see, I’ve got the subscribe button and the related video and playlist. If you don’t want to spend time creating your own custom end screen, then check out OutroMaker. 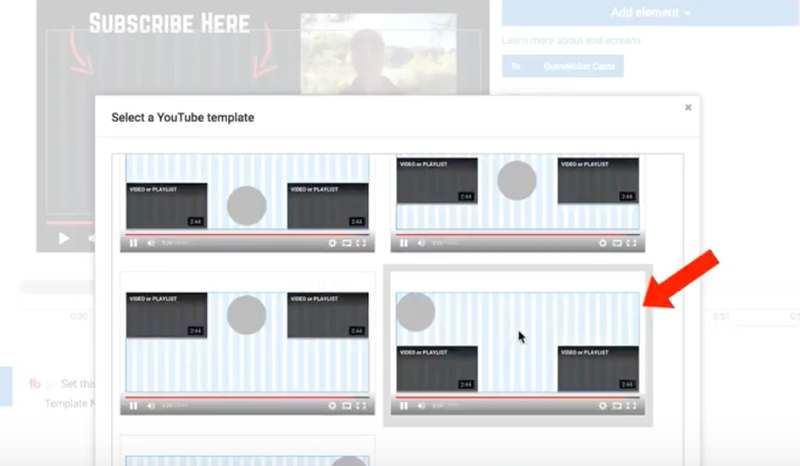 You can easily create animated end screens for YouTube videos and also mobile-friendly Cards with one click. You can try it for seven days with no credit card. Here are 4 example end screens created with Outromaker…. Above are a few examples of different end screens you can create with OutroMaker. 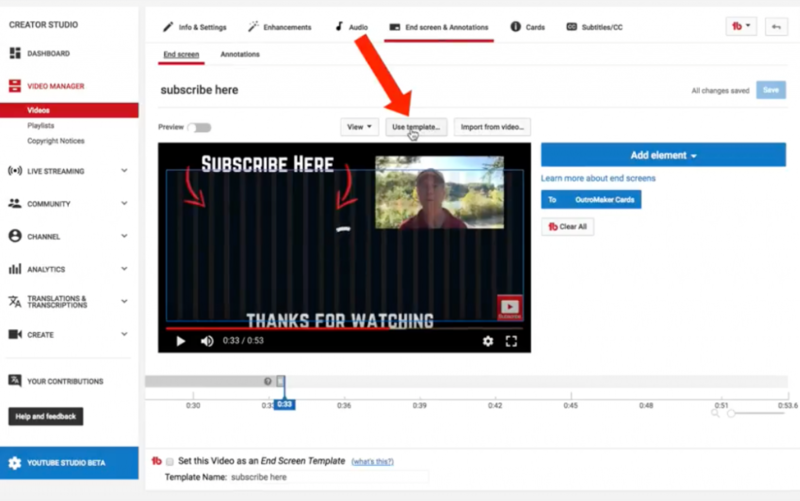 Here are five important things to keep in mind when creating a YouTube end screen. The YouTube end screen is also called an end card, end slate, or outro. checking out the next video. Try different calls to action in your end screen elements to see which one gets the most clicks. 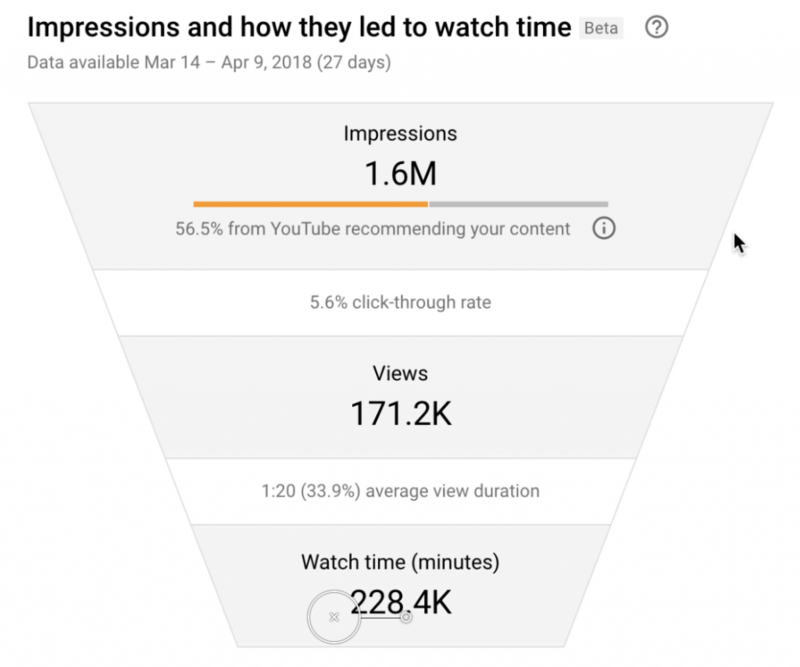 Visit YouTube Analytics to track the performance of your end screens. 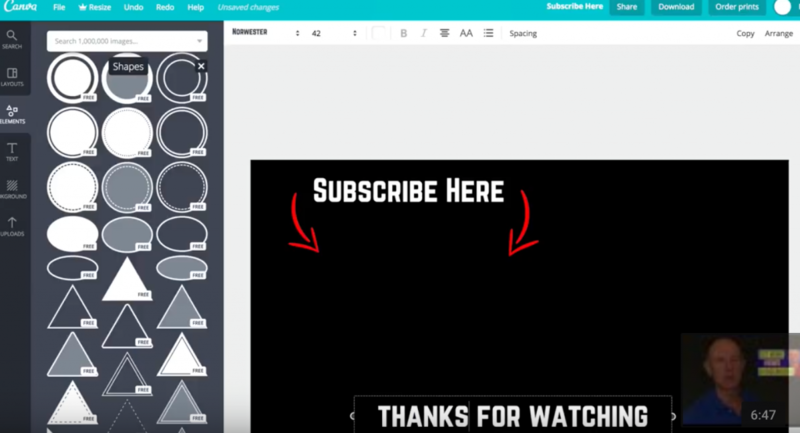 Download my end screen template by clicking on the link in the description below this video. 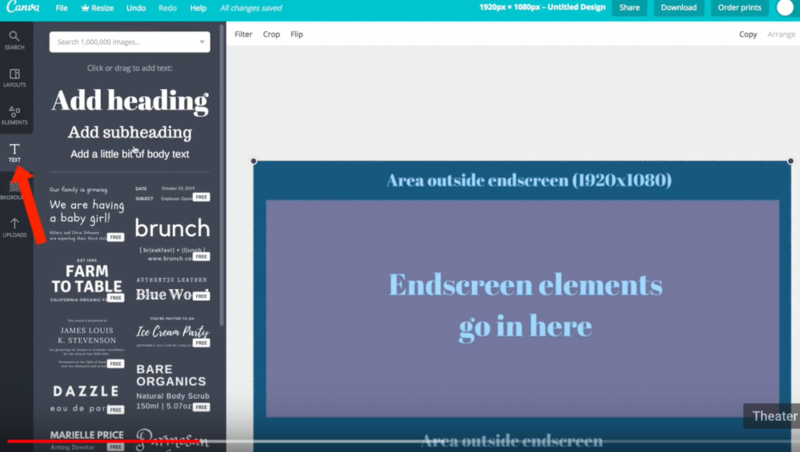 You can use the custom template to create your own custom end screen template using Canva. If you want to save time and don’t want to bother with figuring out how to create your own custom end screen, then use a service like OutroMaker. Did you know that the top traffic sources on YouTube are YouTube Search, Suggested Videos and Browse Features, however, Browse Features is the top traffic source for newly published videos. In the video below, I’m going to show you how to rank in Browse Features, so you can get more views and subscribers to your channel and videos. Browse Features is my top traffic source for newly published videos. Therefore, I’m going to explain what Browse Features are, where to find them and how to rank I Browse Features on YouTube. Click Here To Subscribe To My YouTube ChannelWhat are Browse Features? According to YouTube, this is the traffic from the homepage/Home screen, the subscription feed and other Browsing Features where the viewers are signed-in or signed-out. Let’s take a look at the Home screen. The Home screen is what viewers first see when they visit youtube.com or open up the YouTube app. It’s where YouTube tries to deliver the most relevant personalized recommendations for you to watch. It’s also the place where your videos will be found by non-subscribers. When you visit the Home screen, YouTube will recommend videos from your subscriptions, videos watched by similar viewers, new videos and more. It’s also a place where your videos will be found by non-subscribers, how YouTube recommends these videos, how well the video has engaged and satisfied some of the viewers plus your search and watch history, how often you’ve watched videos from another channel or on a particular topic and how many times YouTube has already shown that video to you. Keep in mind that subscribers watch more videos from the Home screen than they do from the Subscriptions feed. How do you get your videos to show up on Home? You got to upload your videos on a consistent schedule, so viewers will know when to expect a new video will be published. Try to keep your viewers engaged throughout your video and encourage them to come back for more. You can achieve this by giving your viewers what they want to watch and offering solutions to their problems. Include cards, transitions and graphics to reset the attention of viewer while watching the video. Keep doing what works. When you notice that a video has done well by studying YouTube analytics then create more of the same video. This will enable YouTube to serve us more videos of what people have liked. Study how often your channel appears on the Home screen by visiting YouTube analytics and a Traffic Sources Report. Click Browse Features then click on Home. The Home screen and the homepage make up most of the traffic sources for Browse Features. When people visit your channel homepage they should know immediately what your channel is all about. Therefore make sure you correctly optimize your channel homepage by creating an attractive channel banner, a customized channel trailer and adding sections to the channel home page. Click here to watch my video on how to correctly optimize your channel homepage. Watch later comes next as far as getting the most traffic. The Watch later tab appears on your channel homepage. Watch later is a special playlist where you can add videos that you don’t have time to watch but you want to get back to them later. You might have noticed the Watch icon when browsing through the recommended videos on your Home screen. If you click the watch icon the video will be automatically added to your Watch later playlist. Watch history got the third highest traffic source after Browse features. It refers to the list of videos you’ve previously watched. This enables you to share the videos with a friend or to watch them later. It also helps you to find videos in the future. The Home feed displays videos based upon your watch history. Keep in mind that if you’re not signed in to YouTube channel you won’t be able to see the list of videos that you’ve watched. YouTube displays videos on your Home screen based on your past browsing behavior. If you watched a lot of cat videos recently, YouTube knows what you’ve watched and will serve more cat videos on your Home screen. The subscriptions feed attracts the least amount of traffic from Browse Features. Subscribers are viewers that have opted in to receive more of your videos and they can view them from any part of your site. Because they liked the content from your channel they’ll become your biggest fans and provide the initial signals for your newly uploaded videos. 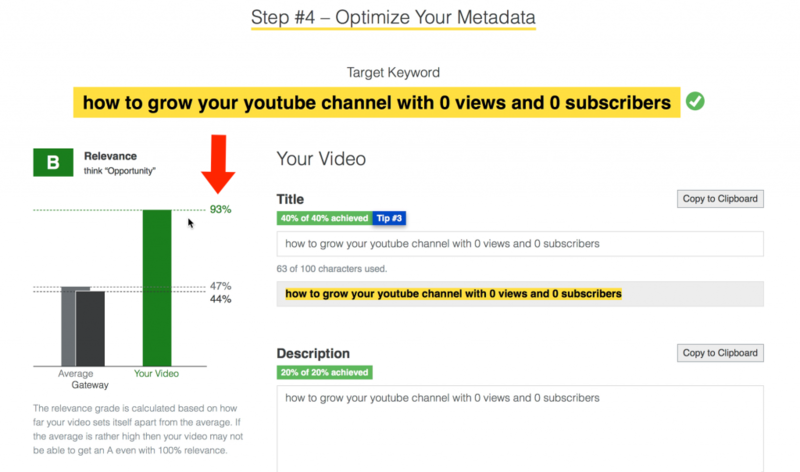 Most of the traffic from your newly uploaded videos will come from subscribers. The Subscriptions tab shows the collection of videos from the channels that you subscribed to. It includes highlighted videos and list of the most recent uploads. Keep in mind that subscribers will see some subscription content on their Home screen and Suggested Videos. Ask viewers to subscribe at the beginning and end of your video and give them a reason to subscribe. 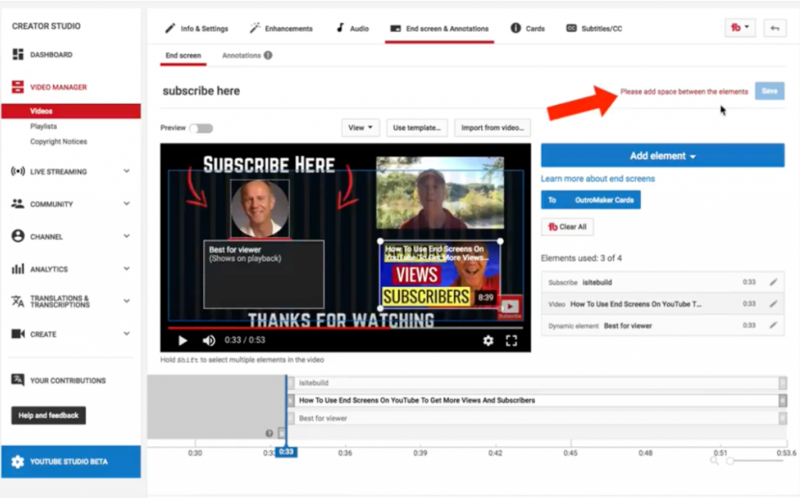 Encourage them to watch more videos on your channel by redirecting them to related videos via end screens and cards. Make your videos public when you think most viewers will be watching. You can figure out what country most of your subscribers are coming from by visiting the demographics in YouTube analytics. Keep in mind that your subscribers are subscribed to many different channels, therefore the number of subscribers will be higher than the number of views that you get on your video. Keep in mind that subscribers don’t necessarily watch every video you uploaded. Check which videos are attracting the most subscribers by going into YouTube analytics and click on these subscribers link. Identify videos you can make more of to attract more subscribers. 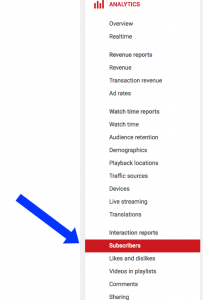 Check the traffic sources of your subscribers by going into YouTube analytics, click on Traffic sources then Browse Features then click on Subscribers. Now you know what Browse features are, where to find them and how to rank in Browse Features. If you implement the lessons in this video you’ll attract more views and subscribers to your channel. 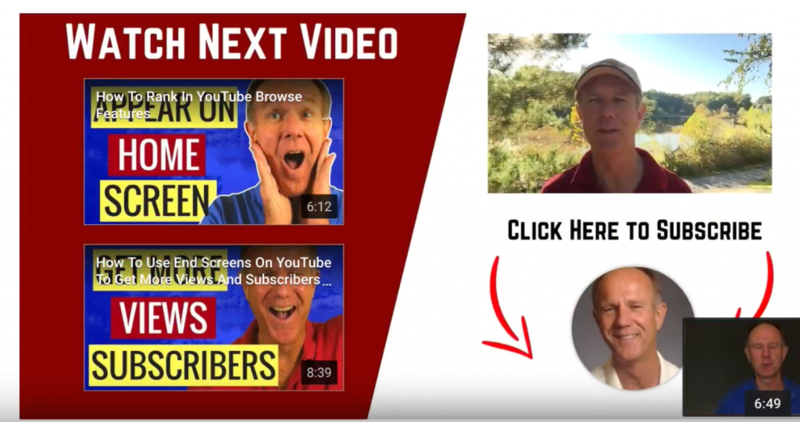 Do you want your videos to be discovered in the YouTube search engine, so you can attract more views and subscribers on autopilot? In the video below I’m going to show you the steps and tools I use to rank in YouTube search. These are search terms used by viewers on YouTube to find your content. For example, last weekend I wanted to install a new toilet. I simply entered, “how to install a toilet” in YouTube search and I got a list of videos to watch. 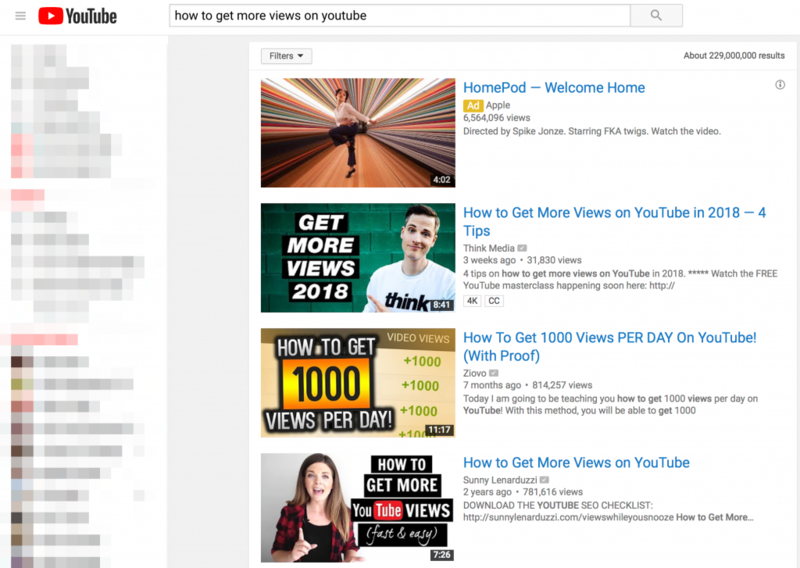 Here are 7 steps to get your video discovered in YouTube search. Let’s look at the manual way first. Enter your main keyword in the YouTube suggestion box. Select a low competition keyword phrase. This is a long tail of keyword phrase of three or more words. Keep in mind that a single keyword would be very hard to rank for because it will have a ton of competition. Instead, you want to select a less competitive keyword phrase that will still attract traffic. Look at the top 10 results in the YouTube browser for your keyword phrase. How old is the video? If the video’s one or two years old, you can create a more recent video that will have a higher chance of ranking on YouTube search. Other videos ranking for the exact keyword phrase is as none or one or two videos ranking for the exact keyword phrase. You have a great opportunity of ranking for YouTube search. How much activity do the videos get? If the videos get a lot of views and comments, they’ll be hard to rank for that phrase. If the video’s not getting much activity, or there’s only one or two videos that get activity then you have a great opportunity. Does your keyword phrase appear in the title, description and tags? If the exact keyword phrase doesn’t appear in the title description and tags, then you have a great opportunity to rank in the YouTube search. using the keyword research tool MorningFame. Enter a video topic in the box. For example, how to grow a YouTube channel. Automatically it gives you the suggested keyword phrases from the YouTube search engine. 2. Choose a target keyword. 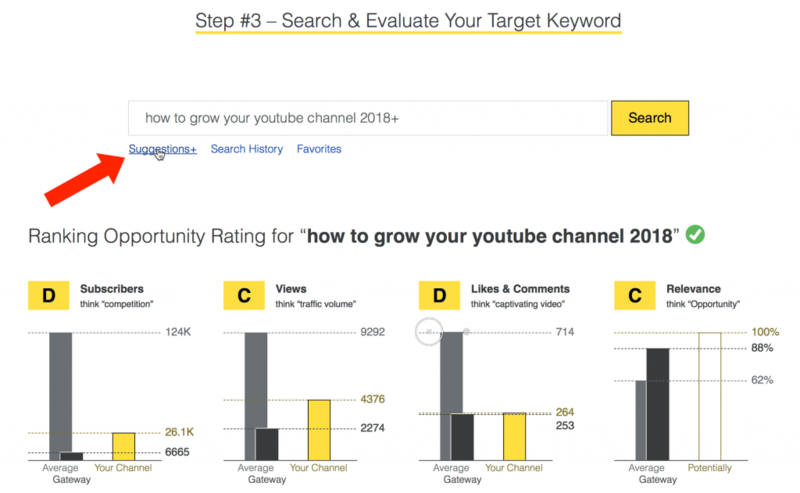 I’ll select “how to grow your channel 2018” Click “choose to Step Three” which is search. As you can see, I’ve got a very low rating here for subscribers, views, likes and comments and relevance. Let’s look at some more suggestions. and zero subscribers.” That’s a little better. I’ve got B for subscribers, for views, C for likes and comments and A relevance. Here are the search results of competing videos. Then I can go to “Choose to Step Four” (Optimize). As you can see the relevance is a D at this stage and the title is 40% of 40% achieved. If I put that same phrase in the description which is 0% of 20% achieved. Now, I’ve got 20% of 20% achieved and my relevance score goes up to 91%. For tags I’ve got 31% of 40 % achieved, so I’ll put that in the tags also. 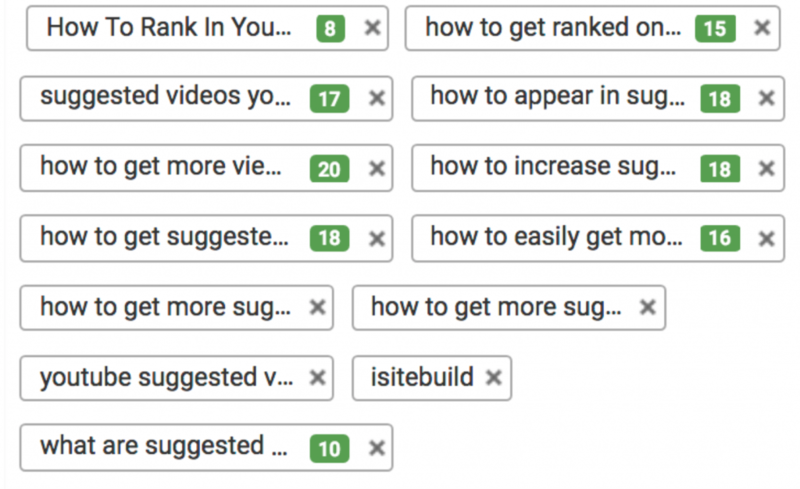 You can now see I’ve got the relevant tags already listed 11% for my keyword phrase and then “how to grow your YouTube channel”, “how to grow your YouTube channel easy.” I can also get some more suggestions because I have 400 to 500 characters used. I’ve got “how to grow a channel with zero subscribers” Now, I’ve got 456 of 500 characters used. You can see I’ve now got a relevance score of 93%. Now, I’ve got my next video ready to go. That’s already being optimized for YouTube search and I can just click save. Now that you’ve done your keyword research, you’re ready to move on to the next step. The more engaged your viewer is, the longer they’ll stay watching your video which is what YouTube likes. Start your video with a hook that grabs their attention in the first few seconds then keep your viewers’ attention in the first 10 seconds they’ll more likely watch the rest of the video. Make sure you expand upon the content that you introduced at the beginning of your video. End your video with a strong call to action such as asking people to subscribe or checking out a related video. Add the keyword phrase that you targeted for the video in the title, description and tags. Add related keyword phrases in your tags. Make sure you also create an attractive customized thumbnail because that is what gets the first click to your video. After you publish your video, your work has just begun, make sure you share your video on your social media sites and embed it on your own website. Also, add your video to a playlist. When someone watches a series of videos, you’ll get a longer watch time than if they’re just watching a single video. Track the performance of your videos. Visit YouTube analytics and check the audience retention. The longer someone stays watching your video, the more opportunity that video has to be promoted by YouTube. Click the subscribers’ link to find out which videos are attracting the most subscribers. Click on real-time activity to see the activity of a video and the first 24-48 hours. If the video continues to get a lot of activity after 48 hours, it will do well in YouTube search. You can check the rankings of your YouTube video by using the incognito window in the Chrome browser. 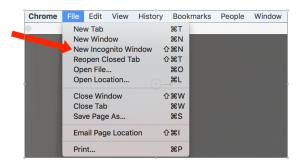 If you don’t use the incognito mode, it will show the ranking results based upon your personal browsing behavior. This means the rankings that you will see will be different to what others see. If you want to use a tool that shows the rankings of your videos and your competitors’ videos in Google, YouTube and Google Videos, click here. It will show you the rankings of the videos on your channel and all your competitors’ channels. Did you know you can also get traffic from suggested videos? These are related videos that appear on the right side, the home screen, channel homepage and what appears after a video has finished playing. 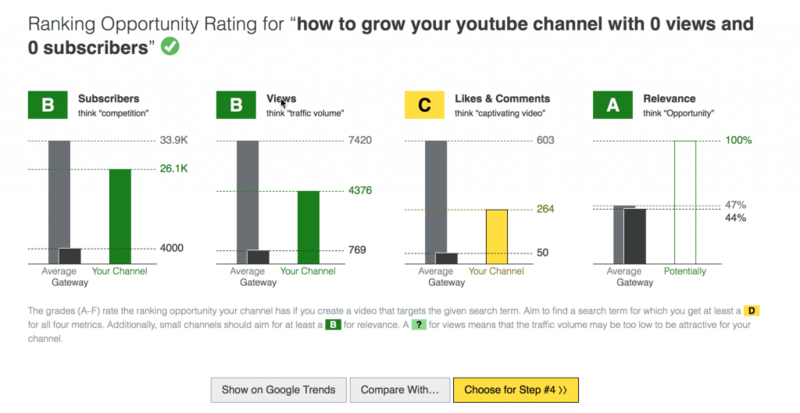 Now you know to rank your videos in YouTube search so you can attract more views and subscribers.